These are some of my favorite video games. They also happen to be truly great games, though they vary widely in terms of the required time commitment and gaming experience. Many of these games are old enough to have spawned “remastered” versions. The remasters are usually easier to find, and are often—but not always—the versions I recommend playing. See the descriptions for more details. This list is not exhaustive. It’s mostly limited to games that it’s possible to play today without too much trouble. As the games get older (and therefore harder to find and play), the selection criteria get stricter. I don’t go much further back than the 1990s, which ends up excluding my beloved classic Macintosh games. Maybe I’ll do a separate list of those someday. The Destiny series of games is omitted because it’s very difficult to go back and play this kind of multiplayer online game after the community has moved on. But I do love Destiny…even if it doesn’t always love me back. I could write many thousands of words about each game, but my failure to do so has prevented me from making this list for too long. In an effort to get the ball rolling, this list does not feature much commentary. It’s mostly just a list, with some information about how and where to play each game. The games are listed in no particular order. Available on PS3 as a download, and on PS4 as a download and a collector’s edition disc bundled with two other games. Coming soon to PC via the EPIC Store. This is the most accessible game on the list. It only takes two hours to play from start to finish, and it costs just $15. I recommend playing it alone, in the dark, with no interruptions, in a single sitting. A good sound system (or headphones) really enhances the experience. To avoid spoilers, finish the game before reading the article I wrote or listening to the podcast I recorded about the game. This game is nearly as accessible as Journey, and is similarly a good choice for someone who doesn’t have much experience with modern video games. (Some familiarity with first-person 3D controls helps.) Though it is a bit longer than Journey, there are natural intermission points within the game. I recommend playing it in a few uninterrupted sittings. To avoid spoilers, finish the game before listening to this podcast where I talk about it. Available on many platforms. I recommend playing on a system with a controller. Available on PS4, PS3, Xbox 360, Xbox One, PC, and iOS. Available on Mac, PC, PS4, Xbox One, and Switch. Available on PS2, and PS3 as a download and a disc bundled with Shadow of the Colossus. It’s worth the effort to dig out an old console (or borrow one or buy a used one) to play this game. The PS3 version is a remaster with better graphics and no downsides. Prefer it if you have a choice. To avoid spoilers, finish the game before reading my review. Available on PS2, PS3 bundled with Ico, and PS4 as a disc and a download. Both the PS3 and PS4 versions are remasters. The PS4 version substantially changes the art style of the game. It’s not worse or better than the original art style, but it is different. I recommend either the PS3 version or the PS4 version, depending on your tolerance for dated graphics. Though it is not a direct sequel (or prequel), it helps to have played Ico before playing this game. Available for PS4 as a disc and download. Though it is not a direct sequel (or prequel), it helps to have played both Ico and Shadow of the Colossus before playing this game. Available for PS3 as a disc and download, and for PS4 as a disc and download. The PS4 version is a remaster, and it comes bundled with the Left Behind expansion. This is the version I recommend, but you should be sure to play both the main game and the Left Behind expansion—in that order—whichever version you get. Available for PS4 on disc and as a download. Though it helps to have played the previous three installments of the Uncharted series, doing so is not necessary to both understand and enjoy this game. Available for the Wii U on disc, and for the Switch as a cartridge or download (optionally including expansions). This game alone is worth the purchase price of a Switch. I recommend playing on a Pro Controller with the Switch connected to a TV. If you want to hear over two hours of my spoiler-filled thoughts on Breath of the Wild and the entire Zelda series, listen to episode 91 of the Pragmatic podcast. Available for the GameCube, Wii, and Wii U. The Wii U version is a remaster that includes both enhanced graphics and some streamlined quest mechanics. It is the version I recommend. I strongly recommend against the Wii version due to the clunky motion controls, which are absent (or optional) on the other two versions. Available for the GameCube and the Wii U. The Wii U version is a remaster that subtly changes the art style of the game. I prefer the art style in the GameCube original, but the Wii U version is certainly more palatable to modern players. The Wii U version also streamlines a few of the game’s quests. Available for N64, GameCube, and 3DS as a cartridge and download. Available on Mac, PC, PS3, and Xbox 360. The PS3 and Xbox 360 versions come bundled with Half Life 2 and Team Fortress 2, both of which are also great games. This is the rare sequel that matches or improves upon its fantastic predecessor in nearly every way. You should play Portal before playing this game. Available for N64 and DS. The DS version is a remaster, but I’m not sure the improved graphics are enough to make up for the smaller screen of the handheld platform. Fumito Ueda’s first game, Ico, was a beautiful, moody masterpiece. Its spare depiction of a boy attempting to escape from a vast castle with the help of a mysterious companion discarded the gameplay and interface conventions of its day, delivering an almost meditative sense of immersion. Ueda’s next game, Shadow of the Colossus, added the bare minimum of status indicators to the screen to support its complex boss battles that required the player to clamber up and onto a succession of giant creatures. In terms of both gameplay and mood, Ueda’s latest game, The Last Guardian, is a straightforward combination of its predecessors. It features a boy attempting to escape from a mysterious castle with the help of a giant creature. Like Ico, it eschews a conventional HUD, save system, inventory management, power-ups, and nearly every other modern gaming convention. And as in Shadow of the Colossus, players will find themselves scrambling up the back of a large, often uncooperative, incredibly life-like beast (cheekily named Trico). Ico was able to deliver on the promise of its design by reducing complexity in other areas. It’s set in a largely rectilinear castle that the player navigates on foot. It has a small number of enemies. Its environmental puzzles are mechanically and conceptually simple. Similarly, Shadow of the Colossus manages to pull off its extremely ambitious boss battles by removing nearly everything from the game except those creatures. While The Last Guardian attempts to combine the strengths of its predecessors, it’s burdened by the combination of their features. The environment and the player’s movement through it is far more complex than in Ico. The puzzles play fast and loose with their own rules at a few critical points. The giant creature, no longer confined to a limited engagement in a boss arena, sometimes pushes the game mechanics past their limits. Nothing kills immersion more than an acute awareness of the game engine itself. In The Last Guardian, the camera often gets stuck on walls or briefly shows the view from inside Trico. (Spoiler alert: like all your favorite 3D-rendered characters, he’s hollow.) Arguably, Shadow of the Colossus had an even more frustrating camera and control scheme, but that game was released eleven years ago on a far less powerful console. The Last Guardian has made tremendous strides since then, but it’s still not quite enough to avoid illusion-breaking lapses. These shortcomings are compounded by an uncharacteristic lack of faith in its design. Traditional (read: oppressive) on-screen prompts describing the control scheme mar the opening of the game and are impossible to completely banish. A voice-over extends beyond its narrative role to provide a dynamic hint system that is often too quick to reveal solutions. Several brief cutscenes in quick succession at the start of the game undercut player agency. It's tempting to attribute these lapses to Ueda’s departure from the project several years before its release, but the reason is less important than the result. All of that said, it’s important to remember the context of these criticisms. Ico and Shadow of the Colossus are two of the greatest video games ever created. Both pushed the limits of the hardware they were released on, and both have influenced video game designers, filmmakers, and other creative professionals far out of proportion with their modest sales numbers. 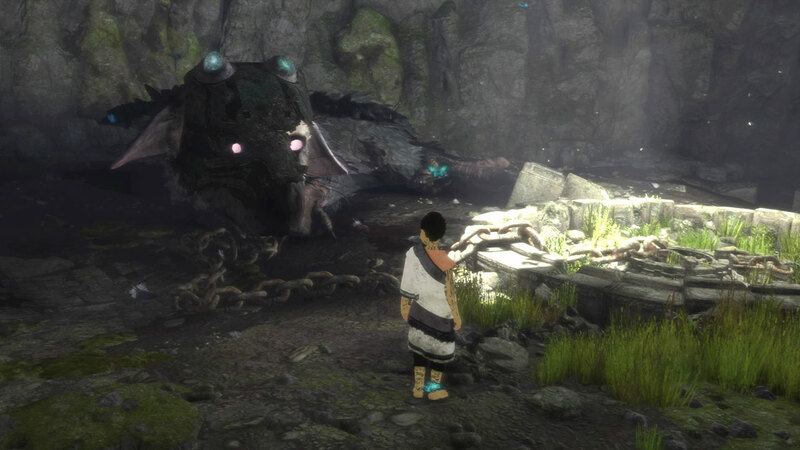 That The Last Guardian fails to resoundingly best its distinguished parents is only disappointing because of how close it comes. Let’s start with the obvious. The Last Guardian is a gorgeous game. The world design is in line with Ico and Shadow of the Colossus, but the increased fidelity of the PlayStation 4 really makes it shine. (PlayStation 4 Pro running at 1080p is recommended for best frame rates.) Lighting effects that Ico could only dream of add a poignancy to already majestic vistas. At so many points, I wished this game had the photo mode from Uncharted 4. Trico is an amazing achievement: a building-sized NPC that truly feels alive. Its animations rarely feel canned or repetitive. Its behavioral inscrutability is completely in keeping with its character. Learning to read Trico’s moods and signals is a core part of the game. The experience smoothly transitions from frustration to a deep, intuitive understanding by the end. Anyone who has finished Ico and Shadow of the Colossus will have no trouble completing The Last Guardian. I found the environmental puzzles a bit more challenging than those in Ico, but I never had to go to the Internet to look up a solution. Anyone who got stuck in Ico will almost certainly be even more stymied by The Last Guardian, however. The hand-eye coordination required is substantially lower than in Shadow of the Colossus, but the camera management and overall control-scheme finesse is much more demanding than in Ico. Also keep in mind that these are comparisons to the difficulty of two much older games. The Last Guardian has a significant skill-barrier to enjoyment when compared to contemporary console games, especially those with such an artistic bent. Inexperienced gamers looking for a better match for their skills should try Journey instead. If you loved Ico and Shadow of the Colossus, The Last Guardian is well worth playing, but it bears the scars of its nearly decade-long development. Like The Force Awakens, there’s almost no way The Last Guardian could have lived up to the expectations accumulated during the long wait for its release. In the end, its reach exceeds its grasp, if only slightly. But, oh, what a reach it was. Like its star creature, The Last Guardian occupies a lofty perch—defiantly idiosyncratic and occasionally inscrutable, but a towering achievement nonetheless. Nearly 15 years ago, I wrote my first review of Mac OS X for a nascent “PC enthusiast’s" website called Ars Technica. Last fall, I wrote my last. Though Apple will presumably announce the next major version of OS X at WWDC this coming June, I won’t be reviewing it for Ars Technica or any other publication, including the website you’re reading now. Those who listen to the ATP, the weekly podcast I host with Marco Arment and Casey Liss, know that I’ve been contemplating hanging up my OS X reviewer’s hat for some time now. Producing thousands of words (and hundreds of screenshots) about each major release of OS X was my first real claim to fame on the Internet. The prospect of stopping has made me reconsider my public identity and sense of self. Who am I if I’m not “that guy who writes those OS X reviews”? But when I finally decided, the relief I felt let me know I’d made the right choice. There is no single, dramatic reason behind this. It’s an accumulation of small things—the time investment, the (admittedly, self-imposed) mental anguish, the pressure to meet my own expectations and those of my readers year after year—but it all boils down to a simple, pervasive feeling that this is the time to stop. I’ve done this. It is done. When I started, I was at the forefront of long-form nerd-centric tech writing. Today, the world has moved on. I might have stopped with my OS X 10.9 review in 2013 if not for my love of round numbers and my expectation that OS X 10.10 would bring a complete interface overhaul that I really wanted to write about. While OS X reviews were my public debut, the Hypercritical podcast brought me to a new audience starting in 2011. 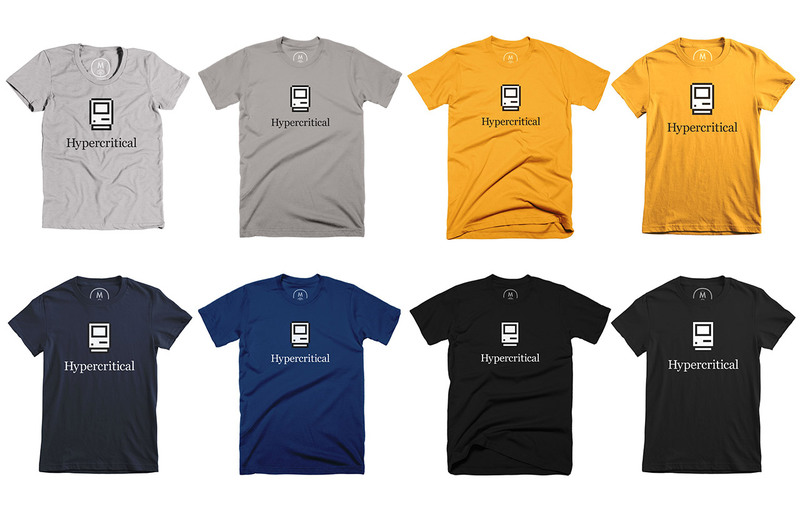 Hypercritical ran for 100 episodes, and in the years that followed I’ve recorded at least one podcast every week. (I’m currently a co-host of the weekly Accidental Tech Podcast and a regular guest on The Incomparable.) The one, long article I wrote about OS X for Ars Technica every year or two has long since been dwarfed by the volume of my audio output. I still love OS X—and I still have many complaints about it. I will certainly talk about OS X 10.11 (whatever it’s called) at length on ATP, and I’ll read the many great reviews written by others when it’s released. But neither podcasting nor writing have ever been full-time jobs for me. I’ve always had to fit them into my life alongside my actual job and my family. Right now, I’m looking forward to my first summer in many years that won’t be dominated by stolen daytime minutes and long, sleepless nights in front of a screen with a noisy air conditioner blowing behind me. I’m content to have reviewed 10.0 through 10.10. Someone else can pick up the baton for the next 15 years.